Whisply is a free online service that enables you to transfer files in a secure way to others using the cloud storage providers Dropbox, Google Drive or OneDrive. You have plenty of options when it comes to the transferring of files to others. Use email, FTP, a cloud storage provider, snail mail, personal meet and transfer, or a free file hosting service. While you may not mind sending unimportant files using email for instance, you may not want to do the same for important files. While you can encrypt files using archiving programs like 7-Zip or dedicated encryption software like VeraCrypt, you may not have those tools in reach sometimes. 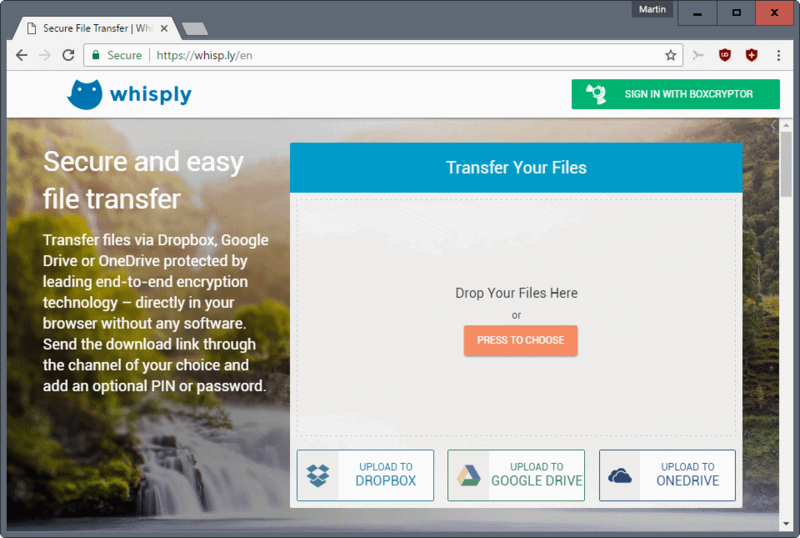 Whisply is a free service by the makers of Boxcryptor that enables you to transfer files securely to others using Dropbox, Google Drive or OneDrive. The service encrypts data using AES-256 and the Web Cryptographic API. Additional features such as CSP, HSTS and HPKP are supported as well by the service. The developers have created a technical overview document which you can access here. Whisply has no file size limit. The developers note however that browsers may very well have one, and recommend to avoid uploading files larger than 10 Megabytes. The service does have a five files per process limit however. The easiest way to overcome this is to compress the files before you select them. The uploaded files are stored in the Whisply folder. It is in the root if you use Google Drive or OneDrive, and in the Apps folder on Dropbox. The makers of Whisply state that they have no knowledge of file contents and can't access them. Visit the Whisply website in your browser of choice. Please note that you need to use a modern browser for that as the service relies on recent APIs. Any recent Chrome, Firefox, Opera, Vivaldi or Edge version should do. Drop files that you want to transfer to someone else on the designated area, or click the "press to choose" button to open a file browser instead. Whisply displays all files that you have added in the interface. The file name and the size is displayed there, as well as an option to remove it from the process. Select one of the available cloud storage providers: Dropbox, Google Drive or OneDrive. Whisply connects to OneDrive, and displays an authorization prompt. You need to accept the prompt to continue (so that the service can place the encrypted file there). The encryption and upload process starts. The time it takes depends largely on the size of the files, and your upload speed. Whisply displays a nag screen for BoxCryptor that blocks the "proceed" button for 20 seconds. Click on proceed to open the sharing options screen. You may set an expiration time for the shared files (never is an option), and enable "one time download". The option makes sure that the file can be downloaded once only. You are asked to pick a security level on the next page. Whisply supports three levels that differ in convenience and security levels. Option 1 is a simple link that the recipient can open to download the file. Option 2 is a link and a pin. The files can be downloaded only if both the pin and the download link are available. Option 3 is a link and a password. The main difference to option 2 is that the pin is always 4 digits, the password custom. Also, you are asked to enter a custom password after you made the selection. The next steps depend on the choices you have made there. If you have selected link only, you may copy it to the clipboard, or use the "send via" email or SMS option displayed. Additional steps are only displayed if you have selected pin or password. Those are options to send the PIN or the password (including options to copy to the clipboard). Whisply is a convenient service by the makers of BoxCryptor that requires no software installation or sign up (you need a modern browser and a cloud storage account though). While I personally prefer to handle things manually, encrypt on my own, upload, share, I can see the use for users who either don't know how to do that, and users who find it more convenient. Now You: How do you share important files? What did I read in one of your other articles about when a product or service is free…? Looks like a marketing thing. The software runs in the local browser so it generates next to no server load and some features are restricted to Boxcryptor Users. Free service, non-local encryption, access to my cloud account, nag screen…not a chance, not recommended for anyone.